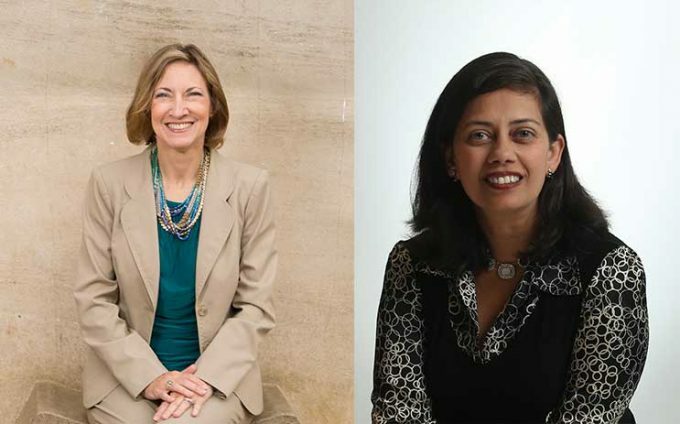 Two academic leaders from C. T. Bauer College of Business have been named Fulbright Specialists, a distinguished honor and program of the U.S. Department of State that connects highly qualified academics and professionals with educational opportunities in 160 countries around the world. Jamie Belinne, Assistant Dean for Career Services at the University of Houston Rockwell Career Center, was named a Fulbright Specialist for 2018-2021. Vanessa Patrick, Professor of Marketing, is a Fulbright Specialist for 2019-2022. Each has been chosen to extend knowledge and promote ties between American and international institutions by sharing their professional expertise. “This is a bucket list thing for me, as someone who has worked in the field for nearly 30 years,” said Belinne. She plans to share career services and development insights in the Asia-Pacific Region, where university career services programs are being introduced at a rapid pace. Patrick, an award-winning consumer psychology researcher and teacher, serves on editorial boards for five of the top academic journals in marketing and has published widely in the fields of marketing and psychology. Her work has been featured by major new outlets such as The Wall Street Journal, Forbes, The New York Times, ABCand NPR. Patrick was Director of Doctoral Programs at Bauer from 2012 to 2015, successfully leading efforts to create a world-class doctoral program. She teaches a highly regarded doctoral seminar and has presented doctoral workshops at schools such as Wharton and the University of Washington. She is also lead faculty for the Women in Leadership program at Bauer. Both programs emphasize the benefits of a “whole self” mindset that leverages life experience for optimum learning and leadership. At Rockwell Career Center, Belinne has led efforts to create a thriving database of employers at UH and oversaw a near doubling of six-month placement rates for graduates over a 10-year period. The author of several books on corporate/college connections and generational workforce dynamics, she was named “Professional Change Maker” for innovations around career development and experiential education by the U.S. National Association of Colleges and Employers in 2012. She has served on numerous boards and as president of the MBA Career Services and Employers Alliance, working with major, global media groups and accreditation bodies around the world on implementation and interpretation of outcomes measures for business schools.